FORMULA 3 were one of Italy's first and most popular psychedelic prog rock band of its time. This band was a trio made up of Alberto Radius on guitar, vocals and bass, Gabriele Lorenzi on keyboards and bass, and Toni Cicco on drums and vocals. The melodies still have that unique Italian-Mediterranean tunefulness, but their voicings are unique. Musically these guys are somewhere in the DEEP PURPLE school with heavy emphasis on guitar and keyboard interplay. In the end they combined to write and record perhaps my favourite Italian Psych rock album ("La Grande Casa") of all time. They put out four early albums which are all different in style. "Dies Irae" their first album is greatly overhadowed by their later releases, but let me say that you must start with this album. 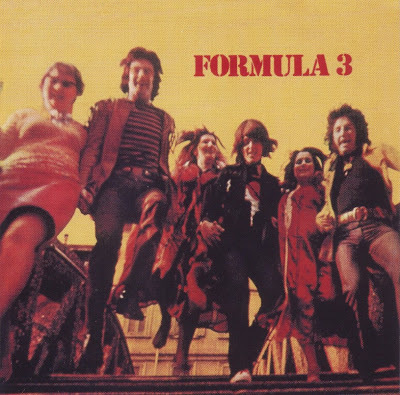 The second album, the eponymous FORMULA 3, appears to be a collection of singles, although the first track runs eleven minutes in length and in fact only two of the tracks were released as singles. Probably the only one worthy of high praise is their third "Sognando E Risognando" a highly inventive album who's styles are very diverse. "La Grande Casa" is possibly their best release, and should appeal to those who enjoy PFM, Le ORME, and Il VOLO. To be fair, "Sognando E Risognando" is supposed to be more progressive than this, earlier albums more psychedelic.